It's already December! Which means it's almost 2014 and we're getting excited for the books that will be released next year! Here are some of the releases we're most excited for. We'd like to let you know that it was REALLY hard to narrow this list down to just 10. 2014 is going to be amazing! Unhinged by A.G. Howard: I LOVED Splintered and I'm SO EXCITED that there'll be a sequel! Split Second by Kasie West: Pivot Point blew me away with its awesomeness and OMG THAT ENDING! Just give Split Second to me now and noone gets hurt! Untitled #2 in the Elemental Trilogy by Sherry Thomas: I loved, loved, LOVED The Burning Sky, it was my kind of fantasy and the romance *SWOON*! I just cannot wait to see what happens next with Iolanthe and Titus and the world they live in! Of Neptune by Anna Banks: This is the final book in the Of Poseidon trilogy, and I LOVE this series! I can't wait to see how things end. Of Triton ended in a major cliffhanger. Infinite by Jodi Meadows: This is the final book in the Newsoul trilogy, which is an absolutely gorgeous set of books. I cannot wait to see what happens to my beloved Sam and Ana! The Geography of You and Me by Jennifer E. Smith: I love Jennifer E. Smith, and this book just sounds adorable! Two people trapped in an elevator during a blackout, followed by a nighttime walk through Manhattan? Second Star by Alyssa B. Sheinmel: A Peter Pan retelling! I am dying!! A Peter Pan retelling?! I'm in. As big of a fan as I am of Maggie Stiefvater you would have thought I'd of heard of Sinner. No so. Now I have! Thanks for the heads -up. I concur with Daisy's list, especially the sequel to The Burning Sky. Can't wait to learn more about the world Sherry Thomas created. I fail at this so hard - #12 links to my post from last week; #25 is the right one. I had to limit myself to non-debuts, and didn't include any books for which I'd already read ARCs, and then I fiiiinally got it down to 10 that way! ISLA is definitely on my list! RUIN AND RUISING, ISLA, INFINITE are all on my list! (Join the INFINITE read-a-thon I'm co-hosting, too!) I MEANT to put the second Sherry Thomas book on there. Oops!! *grabby hands* Alyssa Sheimel has a Peter Pan retelling? ooohh! I can't believe that I forgot about Isla and Infinite! Great lists! A Peter Pan retelling sounds neat. Oh my gosh I totally forgot about second star! YAY for more retellings!! * runs to add to GR * We also have Unhinged, Of Neptune and infinite on our list! So many amazing books coming out! This was Brittany's and my first time participating in Top Ten Tuesday but we are excited to join in on more! So many great books to choose from this week, but I'm glad to see that UNHINGED made it onto your list too. Can't wait for it either!! What a great TTT theme :) so many books I am sure will be added to this growing mountain! A Peter Pan retelling? How have I not heard about this? I am all for it! Isla, Unhinged and Split Second were all on my list too! Love this meme...but now my TBR list is even longer! 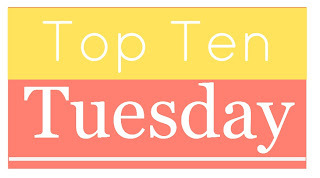 I loved writing a post for this week's Top Ten! I have Unhinged (accidentally wrote Splintered in my last comment) and Ruin & Rising on my list too. There are some awesome books coming out in 2014! The Peter Pan retelling sounds intriguing, and I hadn't heard of it until now. Thanks for the tip! I completely forgot about Second Star! That should be on my list as well, I'm mentally adding it as #11:) Great lists! I can;t wait for Unhinged! I am going to have to read Unhinged, just because I like the cover so much! Another!?! Tell me about more! I've never been able to find a Peter Pan retelling, and I have always wanted one! Great picks, as always ladies! :) I've got a few of those on mine today, too. Especially Isla & the Happily Ever After. Stephanie Perkins writes the best stuff. I'm so excited to finally read that one. I have a feeling ISLA will be on a lot of lists this week! So many great books here. The upcoming year looks like it holds a lot of good reads. 2014, we're ready for you! I had fun finding more books! Haha... just what my parents probably want to hear. Forgot about Sinner by Maggie Stiefvater! But I did put her 3rd in the Raven Cycle. I didn't list Unhinged, as I have an e-galley of it, and intend to read it after the book I'm reading now! So happy to have found this meme! So many books coming out in 2014 that I wish we could have listed them all! Loved this weeks meme! Made me so excited for next year! So many good books coming out!! Oh, Sinner i forgot that one!!! And Split Second! Well.... Fun post, thank you! Ruin and Rising! Oh I'm so excited for this one. I can't wait until the cover is revealed. I hope it's just as beautiful and breath-taking as the last 2 have been. More Darkling + more Nikolai? Yes please oh please oh please. Unhinged and Isla are both on my list, too. Jennifer Smith's books all sound so cute, including the one you listed!! Such a fun topic! And I want to read Sinner, too - just maybe not as much as the next Raven Boys book, which I'm so hoping will be out next year too. TOTALLY on my list, too.